Hickok served for a short time as a U.S. Army scout in Colorado in 1868. Writers have surmised that Bill liked the atmosphere of the towns (wine, women, and card games) much better than a life on the open plains. An appointment as U.S. Marshal in Hays City, Kansas, returned Hickok to keeping of the peace, and pursuing other habits in the local saloons. At the same time (1867), nearby Abilene, Kansas was developing as the earliest of the great staging places for the shipment of Texas longhorn cattle east by rail. Abilene was a wide open town; and into this walked Marshal Hickok. After a series of questionable shootings and conduct, the mayor and his council told Wild Bill that he was no longer needed, and Hickok was fired. Unemployed, Wild Bill decided that he liked being a gambler just as much, and so now he had an opportunity to follow that course. He packed up his reputation and a couple decks of cards, and headed off toward other places in which to try his hand. Buffalo Bill’s Wild West Show was in Nebraska seeking new recruits, and a scout had been sent to inquire if Wild Bill had an interest in joining the show as a sharpshooter at the sum of $192 per month plus accommodations. Wild Bill accepted the job. This didn’t last for very long either. The majority of Wild Bill’s deeds were fabrications cooked up in his head, and since alcohol had taken away his sharp edge he was not performing as expected. He was fired, again. In the downward spiral that overtook him, he tried to resume a career as a gambler, but apparently no longer possessed the skills, the reputation or the illusion. He was repeatedly arrested for vagrancy; he was seldom sober; he was 39. By late 1875 he wound up drinking and playing cards in Cheyenne, Wyoming Territory. 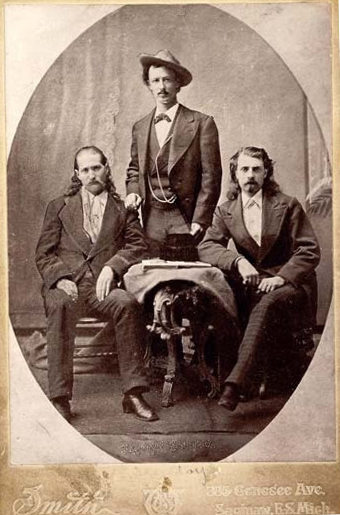 Curiously, when interviewed in September 1876, Buffalo Bill Cody who had met Wild Bill for the last time early in July at Hat Creek, Wyoming Territory, also said that when they shook hands for the last time Hickok had said they would not meet again. Bill met bullwhacker Charlie Utter in Cheyenne, and the two headed north to the wide-open mining camp of Deadwood, Dakota Territory. It was on that trip up from Cheyenne on the wagon train where Bill supposedly met and befriended Martha Jane Cannary, aka Calamity Jane.